This is kind of spooky. 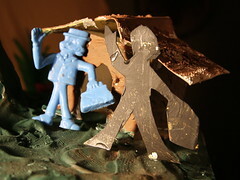 The blue figure on the left is an old breakfast cereal premium of the character Passepartout from a 1970s animated cartoon series, Around the World in 80 Days. I've had this thing packed away in a box for a long time, and hadn't even thought about it in a similarly long time. The figure on the right is a silhouette I cut out of paper a month ago to add to my "Mt. Fuji volcano diorama" to show the students at school. The figure is supposed to represent one of the students, Darby, as she returns home after shopping. I did not consciously attempt to pattern the cut-out after Passepartout. It was supposed to be Darby with a shopping bag. I didn't even remember having the Passepartout figure until I ran across it last night while housecleaning. Yet, the cut-out almost exactly matches Passepartout, precisely in pose and almost exactly in size. This is just too weird for me. Coincidence? Subconscious manifestation? I dunno. Strange, though. I posted this image on Flickr.com last night, prompting P to wryly observe, "I think that's how Kaavya Viswanathan got started." I was kind of wondering what had happened with her. Unfortunate things, apparently. Obviously, as Ms. Viswanathan claimed, we do unconsciously internalize things. I mean, look at these figures: the same stance of the legs, the same shape to the raised hand. Yet all I thought I was doing was making a person-with-a-handbag shape out of cardboard. When I walk into a library, or Borders Books, and see all the books, rows on rows of fiction, stacks on stacks of similar topic nonfiction, I always wonder: how many ways are there to say the same thing? Where is the line for "acceptable use" drawn? What constitutes "inspiration," what constitutes a "reference," what qualifies as a "nod to," what is an "homage," what is a "parody," and what is a blatant rip-off? I see it in movies all the time -- most recently, Pirates of the Caribbean: Dead Man's Chest -- scenes taken almost shot-for-shot from other films. If I draw a picture, or try to, anyway, of a dog sitting at a table, am I plagiarizing the "Poker Playing Dogs"? And aren't the dogs, with their atmospheric lighting and somber expressions, a plagiarism of Hopper's "Nighthawks"? (Check out the Nighthawks link, by the way, it's amusing). When it comes to "creative" works, it doesn't matter how "unique" you are: you're gonna be copying somebody. There are over six billion people in the world right now. Several billion more individuals have lived, and created, in the past. Human creative effort is documented back thousands, even tens of thousands of years. If I make a quick sketch of a bison, am I plagiarizing a French Cro-magnon artist? Maybe there's still a place for stringent plagiarism guidelines in serious scientific research. In the world of popular culture and mass market media, however, I think the edges are getting kind of fuzzy. Yes, Ms. Viswanathan's phrasing and word choice is very similar to sentences from other novels. But it's similar, not identical; it's used in a similar, but not identical story, just as all genre works are similar. Did I copy the Passepartout figure when I made my paper cut-out? No, but it sure looks that way; if the case went to court, I'd have a hard time defending myself since I actually owned a plastic Passepartout cereal premium figure. I really don't know why my paper cut-out looks so much like the plastic cereal premium. Was I unconsciously copying something I'd seen years ago? Or are there only so many ways to make an image of a little figure carrying a handbag? Not that anyone's ever going to sue me for my little hobby photos at Flickr or my sarcastic parody stories at SparkleSystemSix. But I have to wonder, if I were ever to consider attempting publication or professional work, would it be worth the effort? Would it be worth the risk? Who knows whom I might be accused of copying? I know I'd be copying somebody, because no matter what I might do or say, or how I might do or say it, it's already been done by somebody, somewhere, at some time. Now consider that you write something completely and truely unique. Something that is not copying anything from any previously 'created' work. You would most likely end up with something that nobody can read or understand. Because to prevent copy you would have to cut out all the well known elements. Those elements that people use to reference a written setting in their own experiances.